The best part (aside from the amazing taste) is that this is only 5 simple ingredients! That means it’s perfect for EASY MEAL PLANNING! 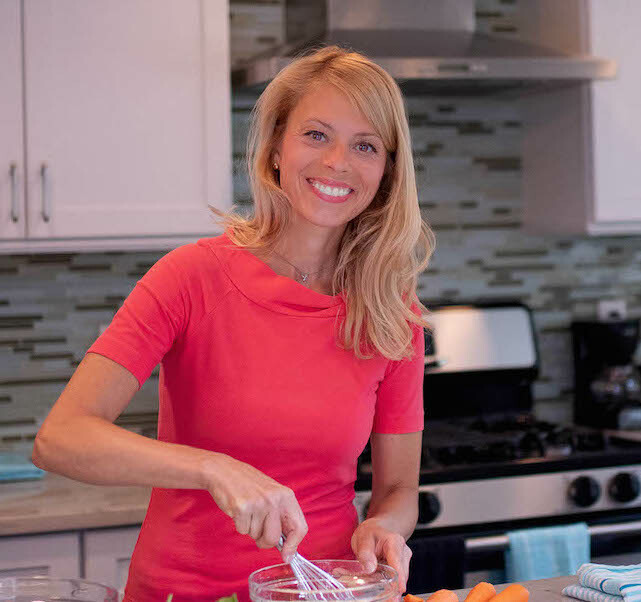 Check out my Meal Planning Kickstart Free Guide! I went nearly meat-free for the first two weeks of January and really got back in the eating-healthy game. I’m still eating healthy every day with high-energy, vitamin-packed, low-fat, low-sugar, reasonable-calorie meals and snacks. 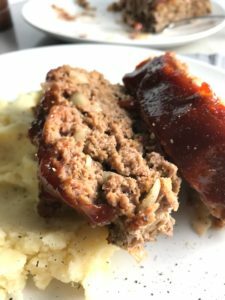 But this Easy Meatloaf recipe was absolutely calling my name for a bit of a comfort food splurge! 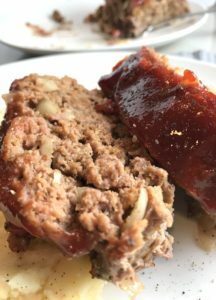 If you love this Classic Meatloaf, be sure to check out my latest 5-Ingredient Mexican Meatloaf too! It really is just 5 simple ingredients (plus salt, pepper, oil). 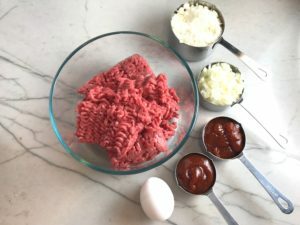 The ingredients are lean, grass-fed ground beef, onion, parmesan cheese, ketchup, and an egg. That’s it! I urge you to try making your own ketchup using honey. It’s delicious and so super easy! 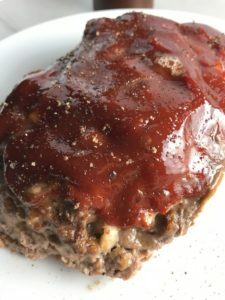 Check it how here homemade ketchup recipe, but feel free to use the store bought stuff! 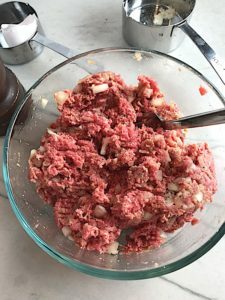 The only prep ahead of time for this Easy Meatloaf (assuming you buy the parmesan already grated) is to dice the onion. I like a larger dice, but you can dice it finely to blend in more. HACK: Worried about crunchy onions in your loaf? Or, don’t have a fresh onion on hand? Dice several onions in advance and freeze them in in a storage bag! The onions will already be soft from being frozen and they cook beautifully. You also always have freshly frozen onion on hand! For more Freezer Hacks to make meal prep easier, download this FREE FREEZER HACK SHEET! Put all of the ingredients in a large bowl with salt and pepper (except the ketchup reserved for the top of the loaf) and mix it with a large fork or with your hands. 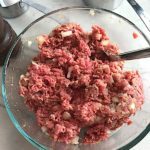 Form the ground meat mixture into a loaf and place into a loaf pan. I like to line the loaf pan with aluminum foil so that it is easy to remove in one piece when it is done, is you simply lift it out by the sides. Spread the remaining ketchup over the top evenly. Cook the meatloaf in the oven 350 degrees F for 60 minutes. Take out and let sit for 5 minutes. 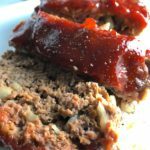 This 5-Ingredient Easy Meatloaf recipe may be short on ingredients, but it is loaded with flavor. The lack of breadcrumbs means you don't have them soaking up the juices, so the meat stays moist - and it's gluten free too! Parmesan cheese, onion, egg, ketchup, salt, and pepper are all that go into this yummy loaf of goodness! 1/4 cup Ketchup for mixing with beef see my recipe for homemade Ketchup! 1/3 cup Ketchup for spreading on top of loaf see my recipe for homemade Ketchup! 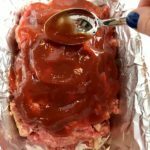 Preheat oven to 350 degrees F. Line a loaf pan with aluminum foil for easy removal of the meatloaf after it is cooked. 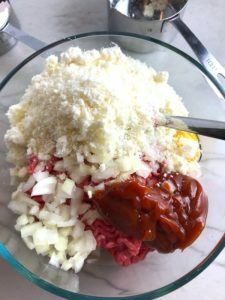 Mix all ingredients (except the 1/3 cup Ketchup reserved for the top) together in a large bowl with a fork or with hands: beef, parmesan cheese, onion, egg, ketchup, salt, pepper. Form a loaf in the loaf pan. 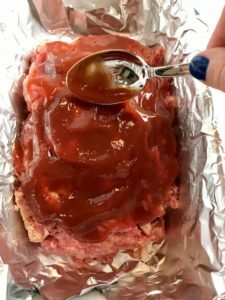 Spread the remaining 1/3 cup Ketchup over the top of the meatloaf. Remove from the oven and let sit for 5 minutes. Remove from the pan, cut and serve with roast or mashed potatoes or salad. Enjoy! Next > Meal Planning & Prep made easy! Hi Carrie, Are you using the powder type parmesan or the hard chunk which you have to grate for the meatloaf? Hi Pam! I like to use the real parmesan found in the cheese section pre-grated finely so it mixes thoroughly throughout the meat. You can also buy it in a block and finely grate it at home. 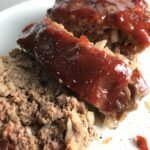 Either way, the parm will melt into the meatloaf and be delicious, so I honestly don’t think you can go wrong here 🙂 Please let me know which way you go and how it turns out! Also, if you are on pinterest, please add pics to show off your creation! Found this recipe tonight and have the meatloaf baking in the oven this very moment. For the cup of Parmesan I used a cup of Cotija, which is Mexican Parmesan cheese. It is larger grained than the kind that comes from the shake cannisters. You find it in the refrigerated section, in a resealable bag, and so it is nice and fresh. This recipe was fast and easy. 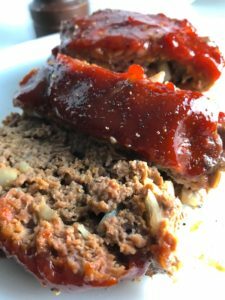 The meatloaf smells great and so I think you just can’t go wrong with this version as an alternative to the classic-style.